The Housing Question has always been an issue for the working class from the moment they were concentrated into urban slums in the nineteenth century. By 1914 90% of UK housing was in the hands of private landlords. In Glasgow this largely meant tenement buildings with one toilet for each “close” and no sanitation inside the house. Before the war there were plenty of empty flats so rents were fairly stable. However, by 1915 hundreds of workers had been brought into the shipyards, engineering and munitions works which covered the city. Rents soared. The Munitions Act made it illegal for war industry workers to change jobs. Most workers were stuck where they lived. And the war also brought inflation. There was no restriction on capitalist profiteering. Like businesses and shopkeepers, landlords enjoyed following the maxim coined at the time of ‘business as usual’. By May 1915 Glasgow’s landlords decided that as costs (what costs? – they did no repairs) had gone up they might as well put up rents. Tenants rightly saw this as profiteering and refused to pay the increase but continued to give the “factor” (the landlords’ rent collector) the old rent. This was the start of the rent strike. The landlords responded by individual evictions via the Sheriff’s Court but were surprised by the collective response. Working class women formed tenants associations like the famous South Govan Women’s Housing Association led by Helen Crawfurd, Mary Barbour, Agnes Dollan and Jessie Stephens which eventually came to cover all working class Glasgow (and were nicknamed “Mrs Barbour’s Army”). They were not alone but were joined by militants from various groups and parties. Notices were printed in thousands “WE ARE NOT PAYING INCREASED RENT” and stuck in virtually every window. The solidarity these actions achieved was the secret of its success. In May only 15,000 households were involved but by November this figure had doubled. Their tactics were also copied in Dundee, Aberdeen, Leeds, Bradford. Edmonton, Barrow, Workington, Coventry and Birmingham. After a summer of defeat the landlords then tried to use the “small debts” court to have rent taken directly from the wages of the workers. Eighteen of them, including “Mr Reid” secretary of the Tenants Defence Association, were brought before the Sheriff’s court on 17 November 1915. 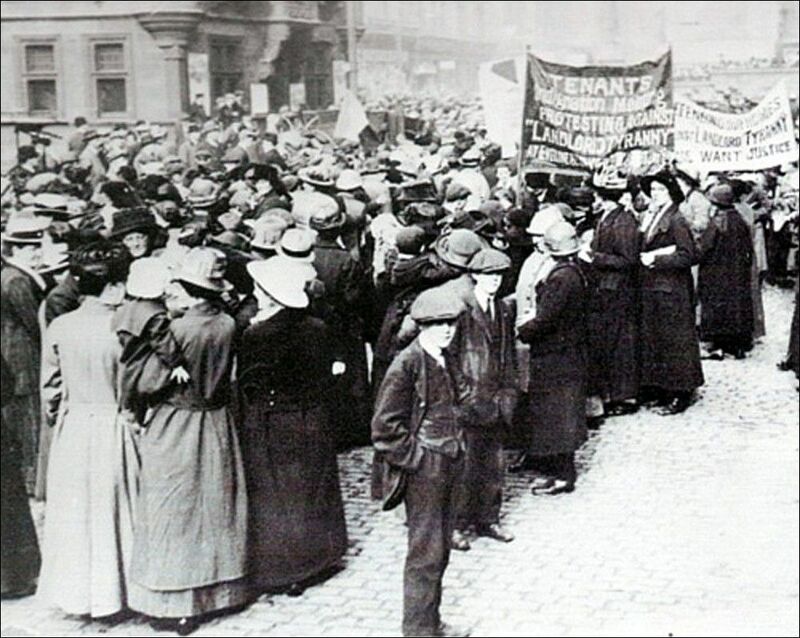 It produced one of the largest demonstrations in Glasgow’s stirring working class history. Tens of thousands of men and women gathered to protest outside the Sheriff’s Court. But this was not just a matter of a single demo. Fifteen of the people charged were shipyard workers and this encouraged workers solidarity. Wildcat strikes erupted at the Fairfield (Govan) and Beardmore (Dalmuir) shipyards. The Sheriff was warned that any prosecutions would be met by a mass strike on the whole of the Clyde. It was no empty threat. A month earlier mass strikes had already forced the Government to release three of the unofficial shop stewards from the Clyde Workers’ Committee who had been imprisoned for resisting the Munitions Act. Suddenly the rules of the bosses’ legal system were thrown out of the window. As the protest grew, the Sheriff adjourned the proceedings whilst he phoned Lloyd George – who told him to give in as a new rent restriction law was about to be passed. He then told the Court that though he was bound to “uphold the law”, “due to the seriousness of the situation” he considered it unwise for the trial to proceed. The factor was persuaded to withdraw the charge to much cheering in and out of the courtroom.